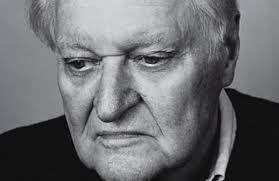 I was sorry to hear that John Ashbery died today. Though not terribly sorry: 90 is an age we can all hope for and, anyway, a poet of worth never really dies, not in the way that you or I will. Sometimes disappearing into valleys, but always on the way. To live afterward, in sunlight and shadow, a certain amount of years. Who cares about what was there before? There is no going back. Moving on toward death. But sometimes standing still is also life. Wow. That one really packs a punch, perhaps especially because yesterday was my birthday.